This concise guide presents Java stripped down to its bare essentials, possibly the only book on Java that you can actually fit in your pocket. 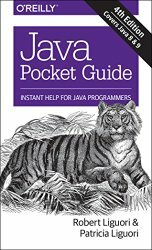 If you've ever been stuck while writing code because you can't remember how something works, Java Pocket Guide, Fourth Edition is an indispensable aid. This latest edition focuses on Java 9, including sections on modular source code and the new Money and Currency API. Practical help for practicing developers.